What’s the most fun you can have in Southern California? Going to Fuller Seminary! Okay, hiking in the mountains and body surfing come in as close seconds. The traffic is terrible and there is nothing quite like being able to see the air you breathe. Fuller is about five miles from the front of the San Gabriel Mountains and they disappear everyday at about 10:30 AM into the smog. Fortunately they come back out by 5:00 PM. My years at Fuller were some of the best years of my life. I loved the learning, I loved the friendships, and I loved the classes. Well, maybe polity class wasn’t all that great but most of the rest were. I don’t think I ever really considered going to a different seminary. Part of the reason was that I had been away from my family for 5 years and I wanted to spend time near Mom and Dad again. Part of the reason was that I wanted to go to an evangelical seminary and Fuller was the best. Looking back I think Fuller opened me to consider new and different ideas. If I had gone to a mainline seminary like Princeton I would have put a wall around me to protect me from all the heresy. Going to Fuller allowed me to relax and learn. Fuller in the 1970’s was an interesting place to be. Some of the scholars who helped start the seminary were still there and some of the new great faculty was coming on board. The biggest problem at Fuller between 1975 and 1979 was the size of the student body compared to the number of faculty. Fuller grew so quickly that the some of the class sizes were immense. They even had MDiV students teaching Greek! I did some tutoring, mainly teaching people English grammar. You can’t learn Greek without knowing English grammar. I took a New Testament Theology class with Glen Barker that had 160 students in it. But I got to study under Roberta Hestenes, Paul Jewett, George Ladd, Fred Bush, Lewis Smedes, Bill Pannell, William LaSor and even Dan Fuller. And yes, I took a bunch of classes from Jack Rogers. I was like a pig who found where the farmer kept the slops. I got to study what I always wanted to study. Even Hebrew was fun. 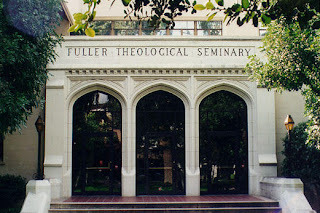 The best thing about studying at Fuller was that the professors didn’t let you just learn evangelical theology. You had to study every perspective. So I read various liberation theologies, process theology, Pentecostal theology, even Quaker theology along with current and past evangelical theologies. I was required to read Luther, Calvin, Augustine, some of the Anti Nicene, Nicene and Post Nicene theologians, and lots of Church History. The one thing missing was any real emphasis on Eastern Orthodox theology. There were so many students from so many traditions you could have a theological argument about just about anything at any hour of the day or night. And since there was the School of World Missions, now called the School of Intercultural Studies, you met a lot of people from all over the world. One of my intercultural learning experiences came one day as I walked into chapel with a friend from Africa. In parts of Africa men who are friends naturally walk down the street holding hands. You all may have noticed that this is not a tradition in America. My friend from Africa took my hand as we walked into chapel and I had this panic reaction. I kept telling myself this was a natural thing in Africa. My emotions told me that everyone around us thought we were gay. We weren’t, after all, in Africa. I got married at the end of my first year at Fuller. I drove back east to New York, got married, went on a week of honeymoon and then we packed up all of Debby’s stuff and drove back to California. We moved into Fuller housing and Debby went to work to support us. It was a good thing my parents lived near by because some weekends we went to Mom and Dad’s to eat because Debby didn’t get paid until Monday. We managed to stretch three years at Fuller into four because we couldn’t afford to pay for all the classes for a three year schedule. Ever notice that if you have a roof over your head, food to eat and books to read that life can be wonderful? We didn’t have a TV, rarely went to the movies, couldn’t afford to go out to dinner but had a blast. We hung out with friends, had each other over for dinner, talked theology, (which put Debby to sleep), played Frisbee and generally had a good time. But the best for me was the learning. I learned how to read the Bible not just as a book with stories but as a book with authority. I learned to read the Bible as a scholar. I learned to lead small group Bible studies. I read theology, a practice I’ve kept up my whole life. I considered going on and getting a PhD. I didn’t and I made the right choice. I am a pastor. I spent one year working in my home congregation developing an Adult Education program. I spent a summer working with youth at another church and the next year working with college students. And then I spent a summer working as an intern in a large congregation. 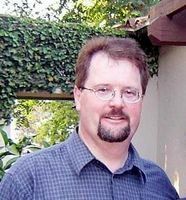 It just so happened that the pastor had been the pastor of my home church in New Jersey had moved to Southern California. He had arrived the fall before and both the associates left almost immediately. Two weeks after I started he and his family went on vacation and I was the only quasi pastor there. It was a 1,500 member church. I survived. It made a big difference in the way I thought of myself as a pastor. In the fall of 1979 I received a call and became the assistant pastor of education and visitation at First Presbyterian Church, Anaheim, CA. Wow, You mean there's another Pastor Bob in the blogosphere who's a graduate of Fuller! And of course has the requisite scholarly pastor's beard! Of course I'm a bit younger -- I did the M.Div walk in 1985 and the Ph.D. walk in 1991. I spent time with some of those you mentioned -- Hestenes,Smedes, Rogers, etc. Spent time with Hagner, Bradley, Brown -- the one class I took in SWM was Latin American Theology, and I was the only SOT student in there. I took the class for one reason -- to read liberation theology. Fun times. I've moved to the left of my Fuller days, but I'm still proud to call Fuller home!